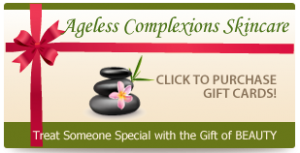 Skin Care Services Karen Lynne provides anti-aging skin treatments as well as services that improve skin appearance and acne treatment facials and regimes at her salon in Newport Beach. Skin Coaching Need Help deciding which products would be best for your skin?? Karen is available via Facetime or Skype. Lets chat!! We sell an extensive line of DNA Skincare Products. Clinically Proven to Stimulate New Skin Growth by 71%. Science and Beauty Have Never Been So Cool! Through a remarkable scientific process, frozen skin stem cells, extracted from a powerful organic source, are applied directly to the skin, regenerating the damaged, weaker cells. The communication between the old and the new cells, reverse the signs of skin problems such as Acne, Aging, stress and damage by healing from within. The skin starts to actually heal itself. OxyGeneo is a 3-in-1 Super Facial. First, a Capsugen tablet exfoliates the upper skin layer to remove dead cells, smooth and renew the skin. 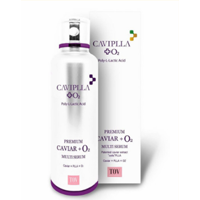 Next Capsugen® cleanses the skin, preparing it for infusion of active ingredients and third the OxyGeneO® effect produces CO2 bubbles which gently burst on the skin surface creating a physiological response, sending oxygen-rich blood to the area. -the latest wrinkle erasing facial treatment from South Korea!! 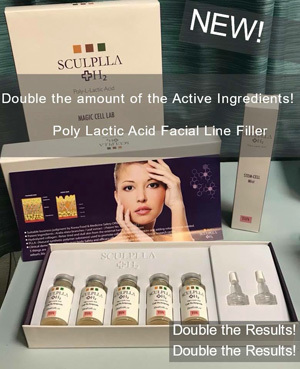 This NEW treatment serum contains the same Poly L Lactic Acid found in the injectable face filler Sculptra used by dermatologists. It has been doubled in dosage along with a blend of anti-aging favorites of caffeine and niacinamide that absorb into the top layer of the skin to plump wrinkles. The mask applied over the serum contains Hydrogen which drives these active ingredients deep into the skin’s layers. Results can be seen after 1 treatment!!! Add Firmness and Volume to your skin. 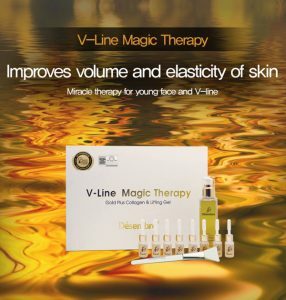 V-Line Magic Therapy is an innovative product for improving sagging and wrinkled skin, having the effect of a medical thread lifting procedure. 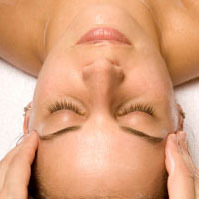 The beauty of skin is not complete until essential circulation beneath the skin is improved. Elasticity come from the balancing of circulation like nature intended. V-Line Magic Therapy defies the forces of gravity! Notice: Please call or use our contact form to schedule your appointment or for product questions and consultations.